A sporty vocation that never sacrifices precious details: this is a man’s watch with gold finishes from the Sealion collection. The king of the oceans, with its bold style and its special inspiration will win over all of you that love to spend time in the water and explore the ocean floor. The collection has been inspired by the vintage watches of the scuba divers, the explorers of the sea who, with their adventures have allowed us to discover a fascinating and mysterious world. In fact this beautiful time-only watch with date is water resistant up to 100 metres, extra resistance to allow you to venture deep down. 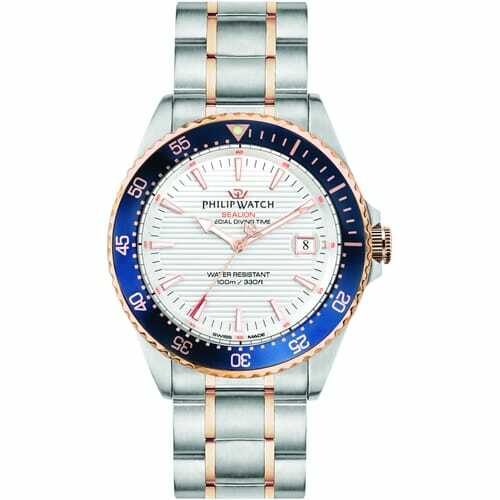 But the sporty style combines perfectly with the elegance and style that have made Philip Watch famous. The watch has a steel bracelet with a pink gold PVD finish and a Guilloché refined quadrant with a stripy pattern. The one-directional rotating lunette, another reference to the sporty nature, contrasts with the rest of the watch and is of a deep blue colour. There is no other colour more suitable to express the passion for sea. This element is embellished by pink gold details, also inside the quadrant, on the hands and indexes. The perfect balance between a sporty style and a sought-after elegance, this watch is the result of an excellent combination of Italian design and Swiss technique, respectively looking after appearance and the mechanisms. Two important components that integrate in the best possible way to give your time a new and fascinating dimension.